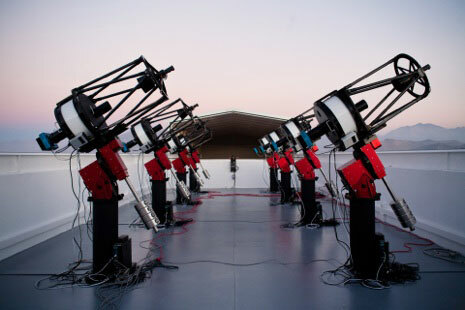 A photo of an array of exoplanet-hunting telescopes in the MEarth Project, which emphasizes M-dwarf stars. Astronomers from the Harvard-Smithsonian Center for Astrophysics take a closer look at migrating exoplanets. Many known exoplanets orbit close to their host star, within one-tenth of an astronomical unit (one AU is the average distance of the Earth from the Sun). Since their orbital periods are therefore very short and their gravitational influences on the host star’s wobble comparatively large, they can be readily detected by the transit and velocity methods. What astronomers do not yet know is whether these planets formed near their present positions from natal circumstellar material close to their star, or if instead they formed at distances larger than an AU and subsequently migrated inwards. There is solid evidence for the effectiveness of migration from computer simulations and observed planetary characteristics. But there are three possible physical mechanisms for migration and (if the planets did migrate) it is not known which mechanism was responsible. The mechanisms all involve planetary interactions: with the protoplanetary disk, with a stellar companion (like a binary), or among multiple planets. Each one imposes its own set of conditions, with different timescales that offer a possible way to discriminate between them. Simulations show, for example, that migrations due to interactions with another body typically take much longer than disk migration. Therefore, close-in super-Earths or Jupiter-size planets around stars younger than one hundred million years would not have had enough time to migrate inward by a slow process such as planet–planet or planet–star interaction. CfA astronomers Elisabeth Newton, Jonathan Irwin, David Charbonneau, and Andrew Vanderburg and their team of colleagues have studied the close-in exoplanet K2-33b, a super-Neptune-sized object with a radius of 5.04 Earth-radii orbiting a young (only eleven million years old) star every 5.425 days. The team considered many alternative explanations to a transiting exoplanet for the light variations (like star spots) before concluding that the planet is real. Because the star is so young, they also conclude that close-in planets can form in-situ, or else they must be able to migrate in short times – a possibility with planet-disk interactions but not with the other two mechanisms. A precise interpretation of the transiting data also required knowing the star’s mass and radius, which the astronomers carefully modeled, and the new result is also significant for being one of the most precise characterizations of a young star’s radius (to within 7%) and mass (to within 16%). Reference: “Zodiacal Exoplanets in the (ZEIT). III. A Short-Period Planet Orbiting a Pre-Main-Sequence Star in the Upper Scorpius OB Association,” Andrew W. Mann, Elisabeth R. Newton, Aaron C. Rizzuto, Jonathan Irwin, Gregory A. Feiden, Eric Gaidos, Gregory N. Mace, Adam L. Kraus, David J. James, Megan Ansdell, David Charbonneau, Kevin R. Covey, Michael J. Ireland, Daniel T. Jaffe, Marshall C. Johnson, Benjamin Kidder, and Andrew Vanderburg, AJ 152, 61, 2016. Be the first to comment on "CfA Astronomers Confirm and Characterize Exoplanet K2-33b"